As I sit down with my journal after four hours of Aikido today — two hours of regular classes and two hours of an ukemi seminar — I feel so dang good it’s criminal. I’m energized, jazzed, content, happy, my body feels good, and life is good — all the result of practicing Aikido and rolling and falling in the grand art of ukemi. Here’s a little of what I took home with me. About 10 students from Castle Rock Aikido, Kiryu Aikido, and DoushinJukubowed onto the mat for the June 6 ukemi seminar, with experience ranging from Nidan to several having started Aikido just a couple weeks ago. One of the great things about ukemi (and Aikido) is that there is always something new to learn or something to refine and improve. Ukemi truly is one of those things that the more you put into it, the more you get out of it. Hmmm, not so much. As Blevins Sensei explained, ukemi is the most important thing for several reasons. First, good ukemi allows us to practice at higher and higher levels as we’re ready with less risk of injury. Second, if a technique is done four times before Nage and Uke switch roles, we have four more times to learn the technique through feeling it (if we’re paying attention). Third, good ukemi allows us greater opportunity to be used as Uke by Senseis when they’re teaching, which provides priceless first-hand experience practicing with these teachers and feeling what it is they’re doing so we can learn from it and mimic it. A side benefit to learning good ukemi is that it can protect us if we trip and fall in the real world. Through the practice on the mat, the body knows how to roll or fall safely, and it’s less likely we’ll be injured. And to add my own editorial comment, ukemi is simply a lot of fun. There’s nothing more fun than being thrown hard by an experienced Aikidoist you trust. Weird, but so true. Another thing Blevins Sensei shares is his belief in *teaching* ukemi rather than letting students figure it out on their own. When we learn how to fall and roll and protect ourselves from our first day of class onward, we develop good skills that get stronger with proper practice over time. Rather than learning a “beginner” style of ukemi first and then having to relearn a more advanced style of ukemi later on, learning correctly how to place our feet after a fall or how to slap or how to roll where we’re thrown helps us develop better skills earlier. With the importance and value of ukemi clearly in mind, we started with rolling practice — first from a kneeling position. One rough spot many students have with rolling is staying round through their arm so the energy dissipates along the arm, over the shoulder, and out the opposite hip. Until we learn to keep that arm extended, but not locked, we tend to collapse and put more strain than necessary on our elbow or shoulder — which feels much more like we’re trying to roll a square block than a round ball. Blevins Sensei offered great tips to help this, like bringing your front arm to meet the mat and getting low before starting the roll, keeping both arms in a circle with fingers pointing toward each other, and looking behind you as you start to roll, which tucks your head out of the way. These tips apply to standing rolls, too, which we did next. Something all students practiced was stepping and rolling with the same hand, same foot, at the same time. So if we’re rolling on our right side, we step with the right foot and roll on the right arm, and not take an extra step (or two or three) getting ready to roll. Also, we need to be mindful of not bringing the arm way up and then bringing it down to roll on it. Just keep it low to begin with. 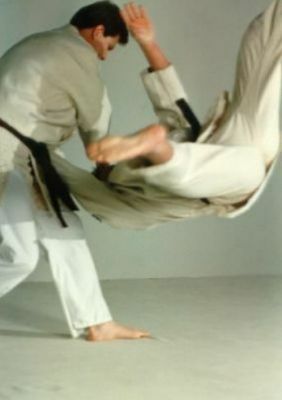 Most falls in Aikido are side falls from a variety of techniques. We can take a side fall from Shiho Nage, Kote Gaeshi, Irimi Nage. Back falls are a bit less common, and we can take those from Juji Nage or Ago Ate, for example. *keep your slapping hand sort of tucked into your body as you’re falling; this prevents you from reaching out to find the mat and taking the fall on your outstretched hand. This is a real-life benefit that will help avoid broken wrists. For back falls, keep your stomach tight and your head tucked, and slap. The next hour or so, we practiced a variety of techniques. Our intent was not to have perfect techiques, but to have the opportunity to practice our ukemi. From Kaiten Nage to Shiho Nage to Irimi Nage to Kote Gaeshi and more, we practiced rolling, falling, being mindful if our feet were in the right position and fixing them if they weren’t, tucking our head, slapping, not reaching back with our hand. For the last 15 minutes, students who wanted to practice breakfalls lined up for a few rounds. Blevins Sensei explained one of the most important aspects of a good breakfall: relaxation. We need to keep a good grip but let the rest of our body relax so it will rotate slowly. Blevins Sensei showed us the difference and there is a noticeable difference in air time when he tightened up versus when he relaxed. One way he described taking breakfalls is floating like a cloud. He also talked about counter pressure and “posting” off Nage to get more energy or to create a rotation point, etc. Blevins Sensei also cautioned about taking breakfalls from someone who’s not very experienced. *The number-one rule: Tuck Your Head. It gets easier, but build the habit from the very beginning. *Be strong AND relax. This is a huge paradox. We’re supposed to keep a tight grip on Nage, and keep our neck tight from our ears to our shoulders, and tuck our head as we fall, but everything else needs to be relaxed. Much like rubbing our stomach and patting our head, this is one of those muscle differentiation things that takes a while to get (and a while longer to really do with any consistency), but it will help everything. *Fix your position every time, and before too long your body will do it for you. *Pain is no big deal. Pain is different from injury, and pain goes away with practice (or the brain doesn’t register it). Either way, it gets easier. My only regret with the ukemi seminar is that it didn’t last longer. Next time, could we have a half-day practice, kudasai? Great recap Kara-san. I think this hits all of the major points that we hit during the day. Now to just get more ukemi practice in! I think the big point is to relax (except tuck that chin) and work on moving with the energy of the nage (thrower). As always Kara, good blog! Ukemi has been a focus in Doushin Juku of late as well, so this was timely. I hope the rest of the gang gets to read it! Thanks for the write up Kara-san. Thanks so much…makes me even sorrier that i missed this opportunity to be tossed around…. You have done it once again! Superb read.